I have broken spider veins on both sides of my mouth. I have a very difficult time trying to cover them. Is there anything I can use in homemade skincare to get rid of them? To be honest, that's a real hard one. The skin care recipes that use a potent source of antioxidants will be helpful along with those ingredients that help to reduce inflammation. But I expect if your broken spider veins are that prominent then you will need to take more aggressive action before they become worse. I have had rosacea since the day I turned 40 which gradually became so bad that I looked like I had used an entire bright red blush product all at once. It was absolutely horrible! Rosacea looks like an entire mass of broken spider veins along with an ever expanding colony of pimples that look chronically red and sore all the time. Although I was able to control the inflammation and redness to a degree it wasn't going away. After 3 treatments my rosacea was gone. Entirely! Nothing! No red cheeks. No spider veins. No colony of pimples. No broken blood vessels. 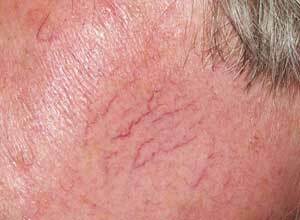 No ugly spider veins. ALL GONE! To this day, 15 years later, I have a "spot" IPL treatment twice a year to keep the rosacea at bay and it has worked wonderfully. There are times when you just really need to seek professional intervention in order to get the results that you want. But IPL treatments work almost instantaneously and you see significant improvement right away. Broken spider veins are a particularly difficult aging skin symptom to get rid of entirely with natural skin care treatments or over-the-counter products.